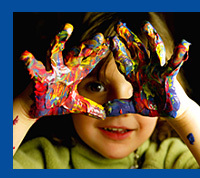 Colorful Hands is all about finger painting and producing amazing one of a kind works of art with children. It’s ALL about the laughs and smiles that accompany the fun of swooshing, mixing and slapping several primary paints into hundreds of different colors and textures. It’s the excitement of creating something new, something unique, something fresh and different. The great thing about painting with children is that each painting is truly a work of art, even if you can't tell what it is. Finger painting with children is a great way for them to experiment, learn cause and effect, and learn about colors and how they mix. And because each child is unique, they produce artwork that bears the stamp of their individuality. Moreover, while finger painting, children learn values, such as how to relate to others, exercise their intellectual powers, dramatize their experiences, express emotion and relax — values which are essential to development. In addition, success in creative activities stimulates a child's feelings of self-worth. At Colorful Hands we don’t teach children how to paint, we teach them how to express themselves using color and creativity, giving them lots of fun and giggles in the process. It’s creative experimentation, building something from nothing, something they can call their own and hang on a wall with pride. Anyone can finger paint and that’s the beauty of why we at Colorful Hands love what we do. We teach that creativity can be premeditated or just simply come from silly experimentation or a combination of the two; thus, what seems elementary in design can be developed into something much greater and bigger than first imagined. Call today to schedule your child’s artistic workshop, or for more information about our amazing creations.